Daimler, trying to maintain its lead over the likes of Volvo AB and Paccar Inc., said it plans to offer highly-automated vehicles, which don’t need drivers on some routes, within a decade. Daimler will start sales of a U.S. truck able to brake, accelerate and steer at all speeds on its own this year, a stepping stone to more automation as growing Internet shopping strains freight companies battling driver shortages. 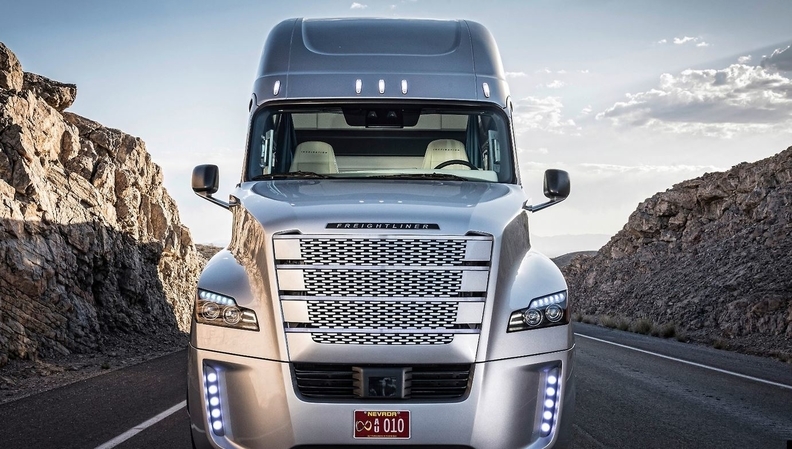 The updated Freightliner Cascadia, also with lane-keeping assistance, will fuse information from radar and cameras to enable partially autonomous technology, Daimler said Monday at the Consumer Electronics Show in Las Vegas. To maintain its lead over the likes of Volvo AB and Paccar Inc., the manufacturer said it plans to offer highly-automated vehicles, which don’t need drivers on some routes, within a decade. Highly-automated trucks will improve safety and boost the performance of logistics, Daimler truck chief Martin Daum said in a statement. Success in North America is vital for Daimler’s commercial vehicles unit to expand sales and profits after global deliveries rose above 500,000 vehicles last year, the highest in a decade. Daimler’s truck unit for years has struggled to lift returns beyond those of some smaller peers with fewer economies of scale and is now contending with rising investments in self-driving and electric trucks as well as digital services. Demand in the region is expected to moderate somewhat during the second half of this year, Roger Nielsen, the division’s North America head told reporters in Las Vegas. The world’s biggest commercial vehicle maker still expects “another great year” as orders remain strong, he said. The North American market is to reach a peak in 2019 after climbing to the highest level since 2006, according to Bloomberg Intelligence estimates. The Mercedes-Benz maker is currently working through its biggest corporate overhaul in a decade to give individual units more independence. Investors have called for a partial listing of the commercial vehicles division. Daimler is investing 500 million euros ($575 million) over the next few years in autonomous technology and is adding 200 jobs for the project, mainly in the U.S. Separately, the company said it doesn’t see a business case for so-called platooning, where two or more trucks are digitally coupled behind one another at a short distance to save fuel. Adding to competition from Volvo’s Mack brand and Paccar, electric-car leader Tesla said it plans to start delivering heavy-duty electric trucks this year.